As promised, here is my sesame noodle recipe. While I’ve been asked to share it many times, I never did because it existed only in my head and wasn’t written down. There’s also a secret ingredient. And with so few secrets left in my life, I rather enjoyed keeping this one to myself. But in the spirit of Independence Day, let’s celebrate by setting this tasty dish loose on a hungry, clamoring world…. In addition to being delicious, my daughter’s favorite pasta dish is stupidly cheap to make. A 1-pound bag of fresh white or egg noodles from the Asian market costs less than $2 and easily serves eight to 10 people. (Angel hair or fettucini works too.) The other ingredients are fresh ginger, scallions, soy sauce, sesame oil and olive oil. Note: If you order “real” restaurant sesame noodles, they’ll be made with flavorful peanut butter and peanut oil, which is altogether pretty unhealthy. Subbing olive oil is better for the body and still tastes great. I’m not a slave to the classic use of scallions either; my preferred summertime alternative is a handful of freshly cut chives from my garden. A touch of white Chinese pepper powder and a sprinkling of sesame seeds are optional. And the secret ingredient? 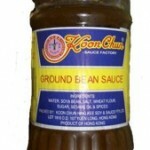 It’s the Koon Chun brand of ground bean sauce. This soy bean paste adds a savory kick to the noodles. The other day, I picked up a 13-oz. jar from the local Asian market and it cost me $1.59. If you’re really desperate, you can order it on Amazon.com. It’ll last for ages. Now, a word for those of you who aren’t in the mood to track down the sauce for whatever reasons….this recipe can work just fine without it! The taste won’t be exactly the same. But I’ve never had any complaints. Once the noodles are made, they can be served hot or at room temperature. They’re wonderful as is. Or, add some slivered chicken breast and cucumbers for a nice main course. 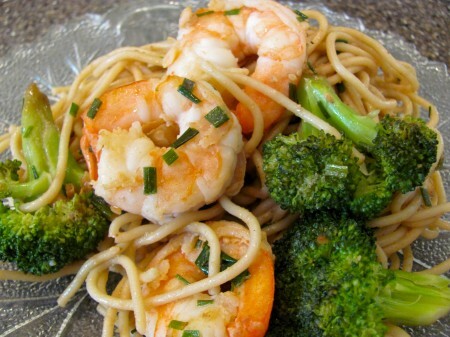 Shrimp with some shredded basil leaves are another option. This dish is forgiving and embracing….feel free to experiment! Boil noodles according to directions. Should take only a few minutes. Drain noodles and rinse with lukewarm water and return to pot. Arrange the ginger and scallions in a thin, single layer in a heat-proof pyrex pie plate or pan. Add the bean paste as just a glob; don’t mix. Gently pour soy sauce in along one edge; try to keep it from soaking everything. Combine your oils in a small metal saucepan. Heat until really hot. Watch the oils. Once they begin to smoke, slowly drizzle them over the ginger-scallion mix to cook it instantly. Work slowly so that you hit all the ginger/scallions; don’t leave them raw. Don’t worry about the soy sauce or bean paste. Doesn’t matter whether or not oils hit them. Take mixture and stir thoroughly into the pot of drained noodles. Add whatever else you want for fun! I made the sesame noodles and along with the salmon with hoisin sauce, and they were both fabulous! Easy and delicious! oh my goodness, i don’t even know you and you tried out my recipes. i’m thrilled. thank you for stopping by to leave your feedback! Where can I get the Asian bean paste? I’m sure Morton Williams doesn’t have it lol. This recipe sounds really good and easy, right up my alley! foodlover! do you live near an asian neighborhood? if there’s an asian market, there’s koon chun bean paste. if not, i just added a link into the blog post to amazon.com. it sells a three-pack, which is waaaay more than you’ll need in an entire lifetime. I love this recipe! I also love your blog. But you know that. :D What blog platform is this?